NHL will allow teams two contract buyouts in 2013-14; who gets them? The NHL’s initial offer in this round of bargaining included a one-time buyout whose money would not count against the salary cap but would count against the players’ share of hockey related revenue. That the players agreed to this “keeping money outside the system” provision, and accepted a second buyout, is a significant concession. Then again, taking a dozen elephantine contracts off the books next season could be beneficial to the players. With the salary cap dropping – the NHL wants a $60 million cap while the NHLPA is asking for a $65 million cap – the union wants to keep its escrow withholdings from spiraling upward. The fewer teams pressed up against the upper limit of the cap, the better the chances are that escrow wouldn’t balloon. How many of those actually come to pass? Scott Gomez ($7,357,143 hit through 2013-14) and Wade Redden ($6,500,000 hit through 2013-14) are goners. Shawn Horcoff ($5,500,000 through 2014-15) would seem a logical choice given he’d still be on the books when the Nuge and Justin Schultz will both be free agents for the Edmonton Oilers. Is it worth buying out the last year of Mike Komisarek ($4,500,000 through 2013-14)? The Toronto Maple Leafs don’t appear to be a team that’ll be capped out. Tomas Kaberle ($4,250,000 through 2013-14) isn’t getting a buyout. Neither is Roberto Luongo, so long as something comes back to the Vancouver Canucks in a trade. 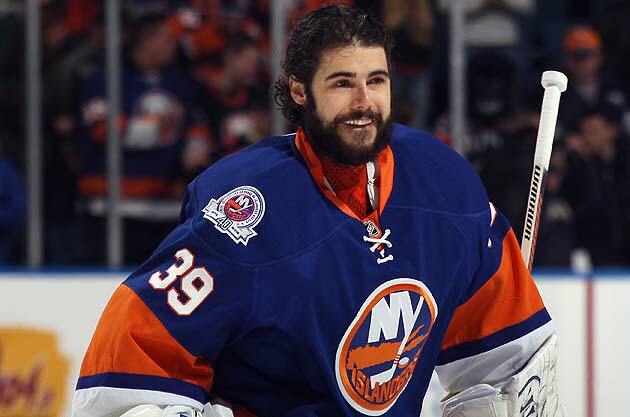 Rick DiPietro of the New York Islanders has a $4.5 million cap hit through 2020-21. Most of the time, he’s an injury exception. When he’s healthy, he’s a serviceable tandem goalie … and that’s a bit much for someone in that role. The expectation is that he’ll get the buyout; but is Charles Wang looking to spend $24 million to correct what he might not see as a mistake? Vincent Lecavalier plays his heart out for the Tampa Bay Lightning but hasn’t been worth $7,727,273 against the cap since … what, 2008? But the politics inherent in buying him out make this one sticky. He’s a franchise player, with deep roots in the community. Would he return after that indignity? 2. Did you see Zach Parise’s name on that list? How about this idea from Arthur Staple of Newsday: Teams should be prohibited from buying out any contract signed last season or last summer? Because we all know the owners were operating in good faith when signing those players, right?